Painting with pastels inevitably creates a certain amount of dust. Inhaled or absorbed over a long period, this can cause serious health problems. By following the precautions on this page, you can enjoy painting with this medium without sacrificing your health. While painting with pastels, you can catch a lot of the dust that's created right at the source, before it becomes a problem. Simply create a “tray” by folding some newspaper and place it beneath the paper as you paint. As the dust falls from the surface, a lot of it will fall into the tray, minimizing the amount that gets on your clothing, on the floor, or gets blown through the house by the heating or A/C system. 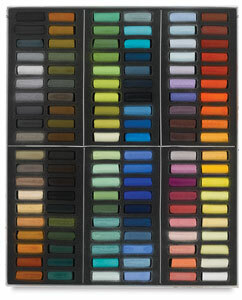 Another common sense precaution when painting with pastels is to use a dust mask when you paint with pastels. From a chemist, I learned that the mask should conform to the NIOSH N95 or N99. That means the filters are not oil resistant and will remove 95 to 99 percent of the dust particles. Interestingly, the more expensive oil resistant or oil proof masks are not as useful for pastel artists; so you can save some money there. Dust masks must be worn properly. If they are not well fitted, you will inhale air through the gaps around the edges rather than though the filter material, which defeats the purpose. If you have a beard, you need to be especially careful about this. Dust masks can be awkward to wear, and they make some people claustrophobic. Compare different models until you find one that's comfortable. If you can't find a comfortable industrial mask, you might check out the masks at a medical supply store. Medical face masks are similar to the N95 masks, but they cost more. Besides wearing a mask, I strongly recommend that you have an air filter in your studio to trap the dust that doesn't get caught by the “tray” under your painting surface. Make sure you use a HEPA filter (HEPA stands for High Efficiency Particulate Air Filters). These filters catch about 99.67% of the dust particle. Pretty impressive! How they came up with that number is beyond me! But it means these filters catch more than 90% of the particles that will make it through a N95 mask! And these are the smallest particles—the ones that penetrate farthest into your lungs. To get the most benefit, you need to put your air filter in the right place. Place your it at least 6 to 10 feet away from your easel. 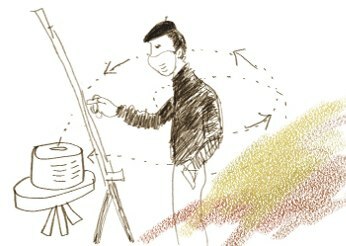 The best position is to the side, not behind either you or the easel (that would block the air flow). If you paint near a corner of your room, place the filter in the opposite corner for a good air flow pattern. You want the clean air to go up to the ceiling, over your easel, and then back to the powerful filter. Make sure the air filter does not blow dust from the easel toward your face. Also, take care that the air flow is not blocked by boxes, furniture, or curtains. Turn the filter on for a few minutes before you start to paint. This gets the circulation going. When finished, leave it running for several minutes to catch any dust that is still in the air. When you shop for a decent HEPA air filters, be aware that some models are louder than others; opt for a quieter one. To find an air filter that will do the job, click here. Don't eat, drink, or smoke in the studio while painting with pastels. Don't blow on the painting. Change out of your clothes and wash them each time after you finish painting. When finished, clean your work area with a wet cloth or a vacuum cleaner that has a HEPA filter. Don't have an air filter yet? Below is a list of HEPA air cleaners that might fit your budget. Having enjoyed painting with pastels for more than 15 years, I bought and really liked the Honeywell model HEPA filter because it is fairly quiet and portable. When you are done with your pastel painting, you can choose to seal the dust with the acid free fixative.